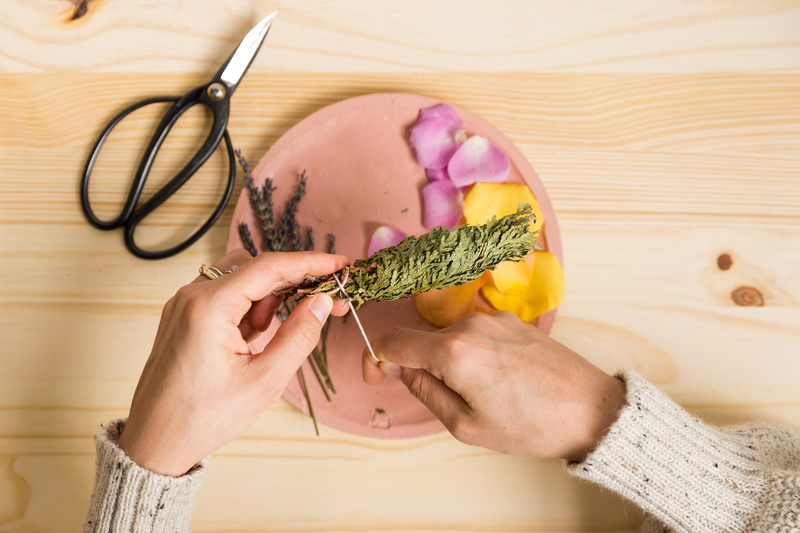 Though you already know how to use sage smudging to clear stagnant energy at home — especially on new moons — Catherine Rising's smudge bundles take the practice to another level with high-vibe herbs, flowers and crystals. 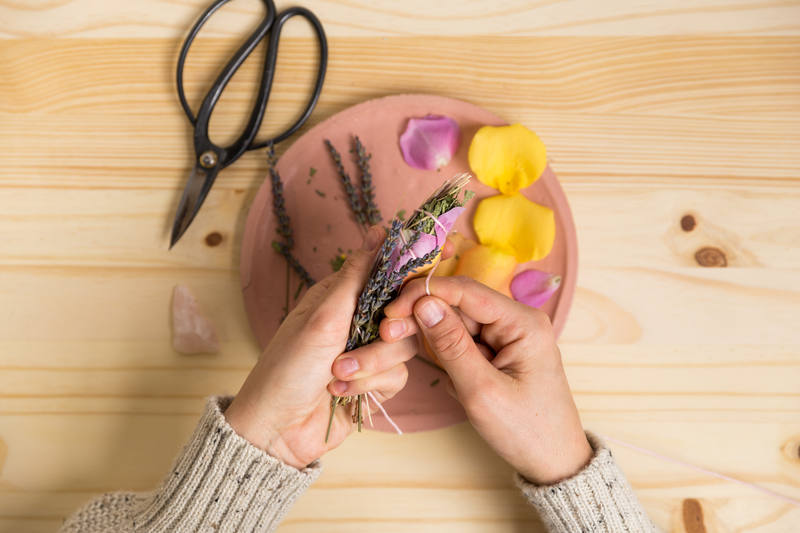 For the uninitiated, smudging your space (or yourself) is essentially an energetic shower that can help you reset and connect before meditation or yoga, especially after a hard day. For these floral bundles, I am using cedar that I cut from my parent's property in Vermont. We bundled it and dried it a few weeks ago, and now it's ready for flowers! #1 I start the bundles by wrapping hemp or cotton string at the bottom. I wrap it over itself a few times so it will hold tight. #2 As I wrap the string up the bundle, I add some sweet grass. I really love how it smells. #3 Next, I add rose petals. 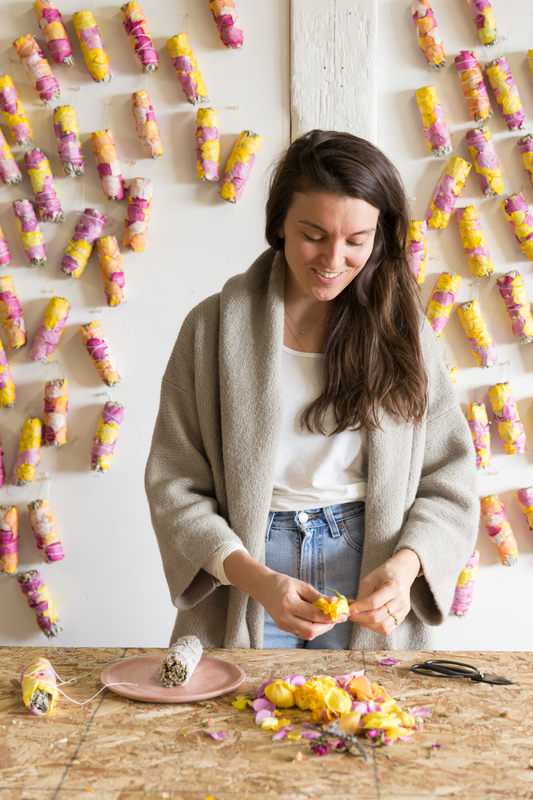 I cross over the petals with the string to get them to lie flat, and add more as I continue to wrap around the bundle. #4 Once I reach the top, I cross the string over itself again and begin to work my way back down, adding lavender. When I reach the bottom, I simply tie it off to the string I started with. Since these were already partially dried, I set them out a day or so to dry, and that's it! Where do you look for ingredients? 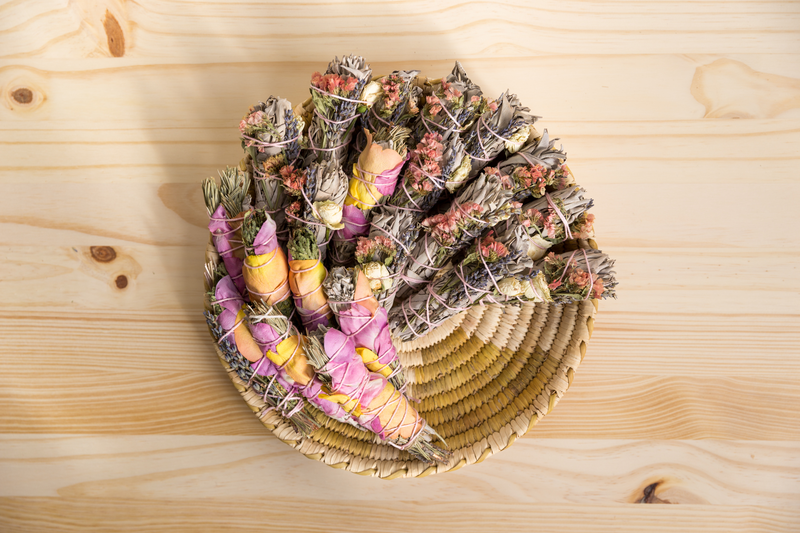 Are certain types of sage better than others for smudging? For me, the best ingredients are sourced locally. I love working with local likeminded women who grow flowers and sage ethically and consciously. What are your favorite elements to add to your smudges? I love using local flowers, and vintage string. Most of our flowers come from a friend who has a flower farm here in Upstate NY. All of our string comes from a local shop that sells donated vintage craft supplies and all of it's proceeds go to an organization which benefits elderly women in need. We frequently use Selenite in our bundles because it has similar cleansing properties. It clears stagnant energy to ensure a smooth flow of positive energy through your body and space. It's one of my favorites. Are there specific herbs and flowers you use for different intentions? 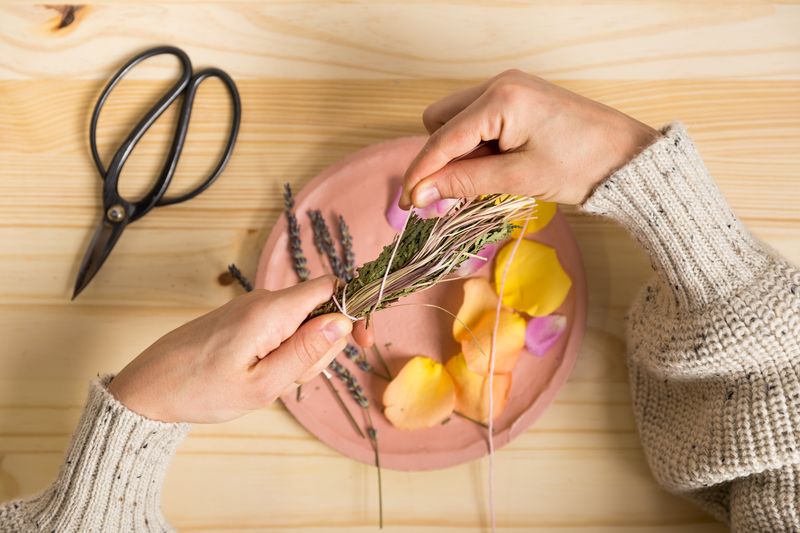 We use lavender, which is said to reduce anxiety and emotional stress, and improve brain function. I also love rose which helps with anxiety and depression, and also attracts love. Last but not least, are you supposed to take the bundles apart before you start burning? We wonder this every time. We get asked this question so much!! You can burn the floral smudges as is, but do take the bundle apart before you burn the Palo Santo. 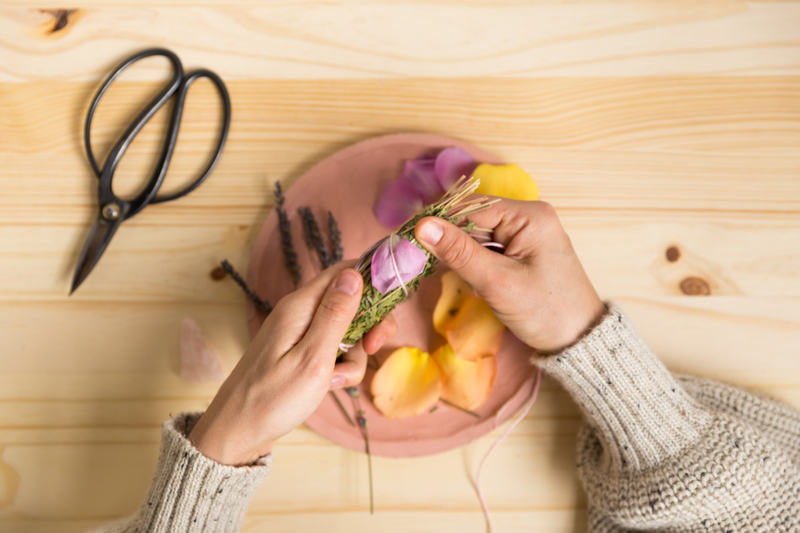 You can actually use the sage or Palo Santo to cleanse your crystal! Then, you can keep your crystal with you, or place it in a meaningful spot.